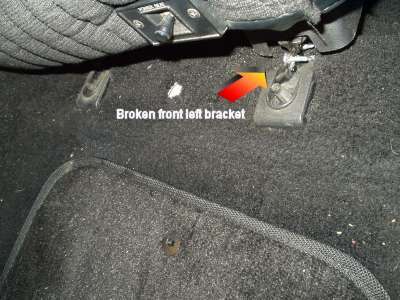 The drivers seat in my 1993 Mustang GT has been broken for years. As I found out, this is a cronic problem in the fox body Mustangs that were equipped with power seats. The front brackets that are bolted to the floor are weak and will break with excess stress. My 'stang had been road raced for a couple of years by a previous owner and I expect that introduced stress that caused the break. I have seen this problem in many fox bodies. If you see the drivers seat saging or leaning back on one side, as you can see here from my broken seat, it most likely is due to this problem. The following picture shows the source of the problem... the weak, and now broken, front hold down bracket. And seen here with the seat removed and upside down. THE SOLUTION... After attempting several repairs like welding and using screws with a backplate, which failed, the real solution was to replace the seat rails. After my research for a replacement and discovering it would cost hundreds of dollars for a power seat rails replacement, I decided to replace the power unit with the old fashion manual adjust rails for two reasons. #1 - I feared that the power rails would just fail again since I do drive the car pretty hard at times. 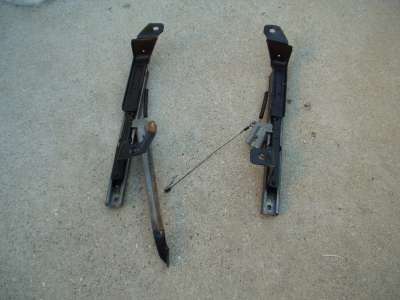 #2 - There are many of the manual rails available on eBay for around $30... seen here. Step 1 - Removing the existing seat is quite easy. 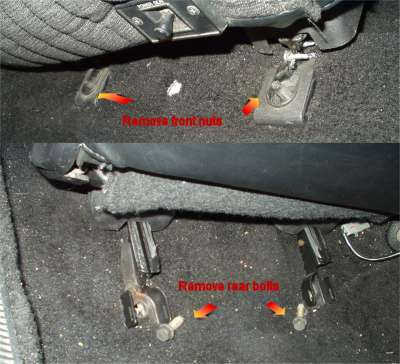 Move the seat all the way back and remove the front two hold down nuts using a 15mm wrench or socket. Then slide the seat all the way forward and remove the back two hold down bolts, again with a 15mm wrench or socket. Lean the seat forward to gain access under the seat and pull the wire connector off of the wire harness under the seat. Pull the seat out of the car and set upside down. 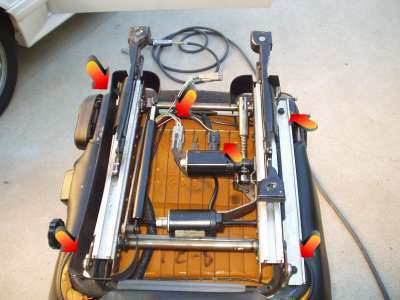 Step 2 - Remove the four bolts that attach the seat track to the seat frame using 10mm wrench or socket.Now disconnect the power connectors from the wire harness on the seat track frame. At this point the power seat track should be free to remove and set asside. Step 3 - Lay the manual seat rails on the seat frame and line up the bolt holes. It may be required to drill the rails to match up to the original bolt holes in the seat frame. As seen in the picture below, the rear holes did not line up on the seat rails I had purchased, so I had to drill the rails. Once the bolt holes match up, use the four original 10mm bolts to bolt up the rails to the frame. Make sure to attach the diagonal pull wire that connects the release lever to the release on the other rail. Step 4 - Finally, place the seat back in the car and install it by performing step 1 again in reverse.If you have the power lumbar support, it will still work once the power is reconnected. Obviously, the other power features will not work, but you will have a solid seat that will not be prone to another break.